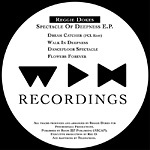 Reggie Dokes: Spectacle of Deepness E.P. http://charlotteskitchendiary.com/charlotteskitchendiary.com/..zip I didn’t think Dokes could top his EP for Philpot, but his latest 12-inch for a European label is even more creative and left-field. “Dream Catcher (FCL Edit)” is sparse and tracky. Two notes tease, repeating with little variation until an entire five-note phrase is revealed. Compared to the other cuts, this one is the most straight-forward. http://charlotteskitchendiary.com/tag/wild-garlic-bread/ “Walk in Deepness” is a soupy horn concoction. Halfway through, jazzy bass and piano join the arrangement. The sounds are somewhat abrasive, but they still seem to soar before dropping out for an unusually long outro. “Dancefloor Spectacle” starts with a blast of disco phasers, then adds vibraphone improvisation and Dokes’ distinctive strings. Again, the outro beats are extended. My favorite piece is “Flowers Forever.” It is dark and melodic with a strange industrial bassline, a thumping kick drum which comes and goes, and old, strained Detroit synths. While the mood isn’t quite happy, it is exciting and cinematic. This EP demonstrates why people continue to look to Detroit for innovative dance music. http://charlotteskitchendiary.com/tag/tuscany/feed/ future classic for sure. Nice site dude.